One of the most beloved of all flowers, roses, produce beautiful fragrant blooms that light up the garden. If you're under the impression that roses are hard to grow, the good news is that isn't the case. Give roses sufficient sun and water, and you'll have success. Roses come in two different forms. In the late winter and early spring months, you'll find roses in bare-root form. This is a rose bush in a dormant state with very little foliage. Bare root is the least expensive way to buy rose bushes. Buying bare root also gives you a greater selection from which to choose. You can find growing rose bushes in the spring and summer months in nurseries. These potted plants are often flowering. Buying roses that are already growing allows you to see what the flowers look like and how they smell. Roses require full sun to thrive and produce plenty of blooms. Choose a location that gets six to eight hours of daily sunlight. If you live in an arid, desert-like climate, select a planting site that gets some afternoon shade. In cold climates, place the rose near a west- or south-facing wall and avoid low-lying areas. This will help ensure that the rose bush avoids freezing during the winter months. The planting site should have rich soil that also drains well. Roses do poorly when their roots remain wet. Loosen the soil by amending the planting area with compost. It's also important to plant in an area that has good air-circulation. Sufficient airflow helps prevent pests and diseases. Roses require regular watering. This is especially important in the first several months while the bush becomes established. When there is no rain, water twice a week. Soak the area surrounding the rosebush well. To conserve water and prevent weeds, mulch roses with shredded bark. Place the mulch two inches away from the base of the plant. Water the soil well before putting down mulch, and then water again once you've mulched. This will help seal the mulch onto the soil so that it will conserve moisture. Roses require regular feedings to do well. Feed the plants on a monthly basis from late winter through early fall. Use a fertilizer designed for roses. This product will have the right amount of nitrogen, phosphorus and potassium to facilitate healthy root and foliage growth and prolific flowering. Roses require regular pruning to continue to bloom. When you prune off spent blossoms, this initiates more flowering. To prune, cut just above a leaf. Prune to create a pleasing shape and to remove any branches that are in pathways. Also, cut any dead or dying stems. If you live in a climate that experiences freezing temperatures in winter, it's important to protect your rose bushes. After the first two to three weeks of below-freezing temperatures, cover the base of each rose bush with mulch. Then place straw, leaves or pine tree branches on tops of the rose canes. This will help protect the plant's roots during freezing temperatures. The best way to avoid pests and diseases is to prevent them in the first place. 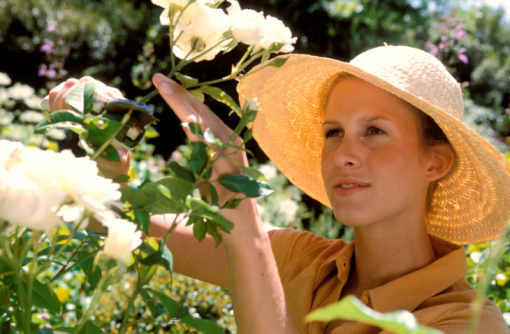 In order to do this, keep the rose bush strong by watering it well and fertilizing regularly. If your rose bushes do develop pests, such as aphids, scale or spider mites, begin by washing the pests off with a strong blast of water. If the pests return, treat with insecticidal soap or horticultural oil. When a rose bush develops fungal disease, such as rust or powdery mildew, treat with a fungicide. Julie Bawden-Davis is a widely published writer specializing in personal finance and business. Since 1985, her work has appeared in many publications, including American Express OPEN Forum, Forbes.com, The Los Angeles Times, SuperMoney.com, Entrepreneur, Debt Help.com, Mint.com and Credit Sesame.com. She has a degree in journalism from California State University, Long Beach and worked professionally as a bookkeeper for a large drugstore retail chain for several years. How Does a Rose Grow?